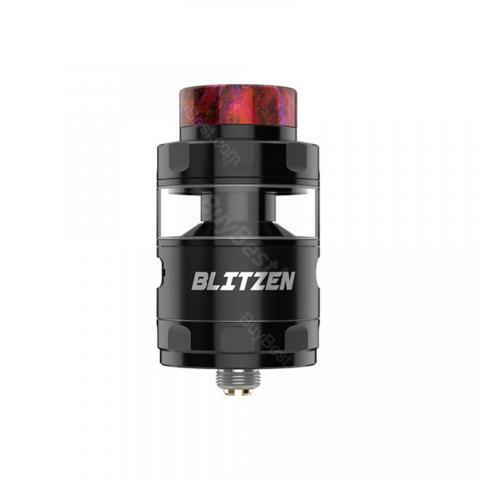 Geekvape Blitzen is a new RTA enabling single or dual coils with a side airflow system. Its shortest air path helps to produce full dense flavor and massive cloud. The Blitzen tank by Geekvape is a newly introduced RTA comes in 24mm diameter, while its build deck is as wide as 18mm, fits for both single coil and dual coil builds. The side airflow design shortened the air path which helps on dense flavor producing. 2ml and 5ml e-liquid capacity to alter by using the bubble glass tube. A resin drip tip decorates the tank on looking. • Smooth side airflow blows directly to the coils to provide full flavor. • Large airflow comes from the side directly in a shortest path to provide maximum vapor production. • Build deck is built into the base for convenient access. • 18mm postless build deck allows easy coil building and supports both single and dual coil build. • You can select Wire, Wick & Tool for easy building at BuyBest too. Довольно красивый и вкусный атомайзер. Стоит опробовать. Si no fuera por su incomodes al cerrar el lugar de abajo lo encontraría uno de los mejores equipos, aun así excelente rendimiento. Everything is fine. Product is ® and shipment was quick (as was delivery). Very good! If you are doing a good roll and good for cotton, it is a huge steam and perfect taste! The development is quality! Very good price! I like the build deck, and this RTA supports both single and dual coils. Very easy to build and wick. This RTA can provide great flavor and vapor. Amazing RTA! Just received my Blitzen RTA and I have to say that it has the best airflow and vapor production in a tank that I've ever had. The tank is designed fantastically and there is no leaks whatsoever. I have several other RTAs and this Blitzen RTA tops them all. Works Perfect. Would recommend to all. I like the looks and the build deck on this RTA!